The 2017 IMSA WeatherTech SportsCar Championship opened at Daytona International Speedway in January with the traditional Rolex-24. It was followed by the historic 12-Hours of Sebring, Long Beach, Circuit of the Americas, Detroit, Watkins Glen, Canadian Tire Motorsport Park, Lime Rock, Road America, Virginia International Raceway, Mazda Raceway Laguna Seca and a 10-hour finale called Petit Le Mans at Road Atlanta. Prototype (P) – These are purpose built race cars and the quickest in the series. Significant changes were implemented to this category in 2017. It included cars constructed to two different set of rules – Daytona Prototype International (DPi) and Le Mans Prototype 2 (P2). 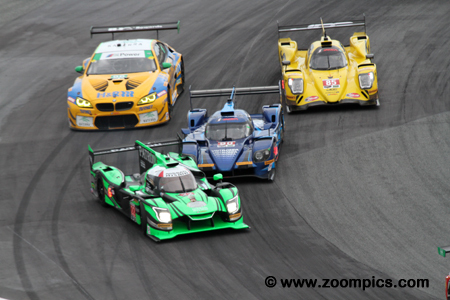 The DPi category includes the Cadillac DPi-V.R, Nissan DPi and Mazda RT24-P. This class allows manufacturers to use their engines. All the P2 cars are powered by a 3.8-liter Gibson V8 engine. Competitors are using chassis’ from ORECA, Ligier and Riley Technologies. Prototype Challenge (PC) – This is a spec class which was introduced in 2010 by the American Le Mans series. This category uses the ORECA FLM09 chassis. The cars are powered by Chevrolet LS3 engine which produces approximately 485-horsepower. 2017 is the last year that Prototype Challenge will be eligible to compete in the WeatherTech series. Grand Touring Daytona (GTD) – This is also a production based class but does not allow the same level of technological improvements that can be made to Grand Touring Le Mans cars. Vehicles in the category include Audi R8 LMS GT3, Porsche 911 GT3 R, Ferrari 488 GT3, BMW M6 GT3, Acura NSX GT3, Lamborghini Huracan GT3, Mercedes AMG GT3, Lexus RCF GT3 and Aston Martin Vantage. Similar to Grand Touring Le Mans, the technical staff uses a number of methods to ensure parity. 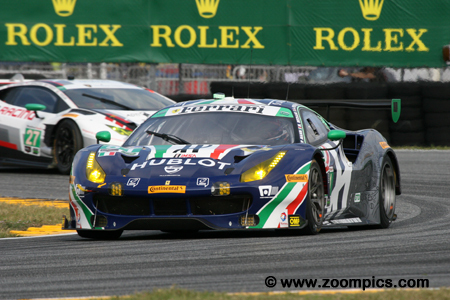 The 55th Rolex 24 at Daytona took place on the weekend of January 28 and 29. There was a total of 55-starters (12-Prototypes, 5-Prototype Challenge, 11-GT Le Mans and 27-GT Daytona). Drivers would compete for 24-hours on the 12-turn, 3.56-mile track which utilized an infield road course and almost the entire tri-oval. With the exception of the Prototype Challenge category, none of the class winners could claim to have scored a dominant victory. In the Grand Touring Daytona class, five cars finished on the same lap as the winner. First to seventh place, completed 652-laps in the Grand Touring Le Mans category. And, the event was not without controversy as a ‘bump and run’ decided the overall victory. 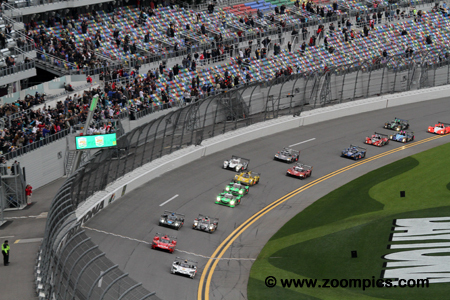 The field receives the Starter’s green flag at the 55th annual running of the Rolex 24 at Daytona. The cars were gridded according to class speeds with the Prototypes first, followed by Prototype Challenge then the GT Le Mans and finally, the GT Daytonas. The pole-winning Cadillac DPi-V.R of Mustang Sampling Racing jumps into the lead followed by the No. 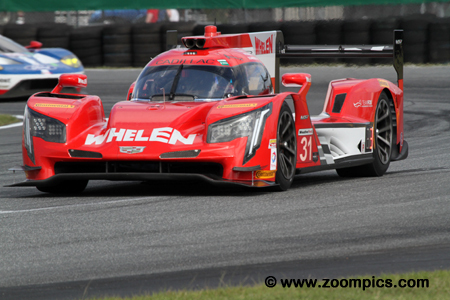 31 Whelen Engineering Racing Cadillac DPi-V.R and the remainder of the fifty-five car field. The Wayne Taylor Racing Cadillac Dpi-V.R was driven by sports car veteran Max Angelelli, NASCAR star Jeff Gordon and Taylor’s sons, Ricky and Jordan. As the race drew to a close, Ricky Taylor was trailing the overall leader, Filipe Alburquerque in the Mustang Sampling Cadillac. Taylor saw an opportunity to pass in the first turn and the two Cadillac’s made contact. Alburquerque slid wide and Taylor was able to slip by and capture the victory. The Prototype Challenge category proved to be a race of attrition. The No. 38 Performance Tech Motorsports ORECA FLM09 shared by James French, Nicholas Boulle, Patricio O'Ward and Kyle Masson qualified on the class pole. During the twenty-four hours, they were the quickest car and had the least amount of problem. At the checkered flag, they finished fifteenth overall taking the Prototype Challenge victory by a margin of twenty-two laps. Cadillac dominated qualifying with Joao Barbosa in the No. 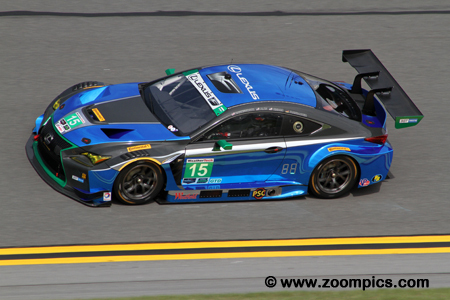 5 Mustang Sampling Racing DPi-V.R capturing the pole position. Sharing the Cadillac with Barbosa were Filipe Albuquerque and Christian Fittipaldi. Albuquerque was leading the race in final minutes when he missed the apex in turn one and was hit the second place Cadillac driven by Ricky Taylor. The incident allowed Taylor to take the victory and the No. 5 team finished second. 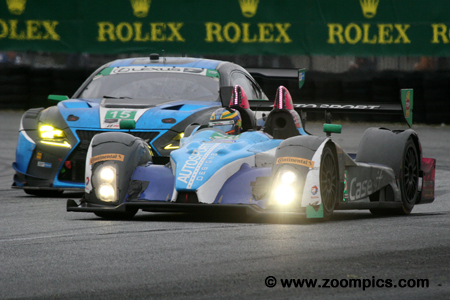 Lexus made a respectable debut at the Rolex 24. 3GT Racing prepared two Lexus RCF GT3s. The first car retired on lap-52 when Scott Pruett had an accident entering the infield road course. The No. 15 Lexus shared by Jack Hawksworth, Robert Alon, Austin Cindric and Dominik Farnbacher was leading GTD in the ninth hour when damage caused by a flat tire cost the team four laps. They recovered and finished fourteenth in class. It was heartbreak for the No. 63 Scuderia Corsa Ferrari 488 GT3 which qualified second in the Grand Touring Daytona category. 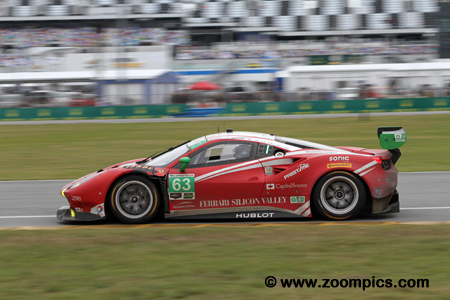 The Ferrari was in the class lead when the engine failed with less than two hours remaining in the event. Drivers Christina Nielsen, Allesandro Balzan, Matteo Cressoni and Sam Bird were classified thirty-eighth overall and sixteenth in GTD. 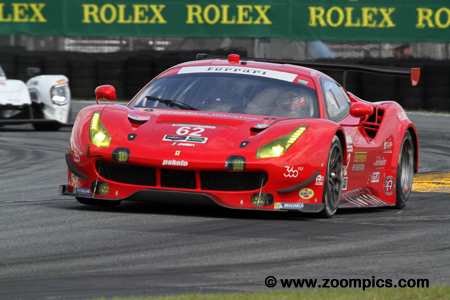 Qualifying for the Grand Touring Daytona class was dominated by the Ferrari 488 GT3s. The No. 51 Spirit of Race Ferrari driven by Alessandro Pier Guidi beat Alessandro Balzan in Scuderia Corsa entry by 0.018-seconds. The Ferrari led the first twenty-five laps but retired early when a faulty engine sensor caused a severe misfire. The team was classified fiftieth overall and twenty-third in GTD. 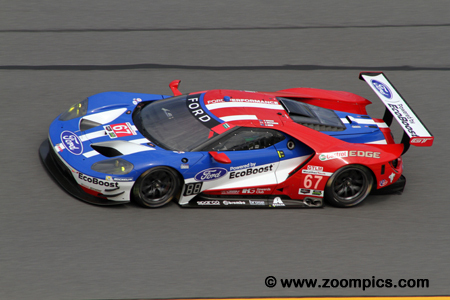 The Ford Chip Ganassi Racing team won their second twenty-four hour race within the last eight months. In June of last year, the Ganassi team was victorious at the 24 Hours of Le Mans. It was not an easy win – in the final moments of the contest, Dirk Mueller passed the leading Risi Competizione Ferrari and then had to hold of Patrick Pilet in a Porsche. Sharing the No. 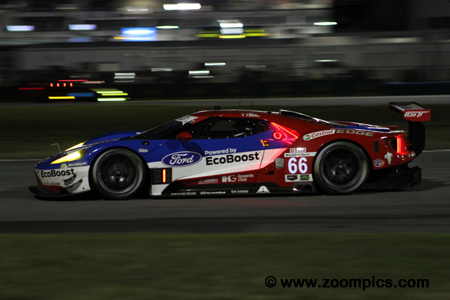 66 GTLM Ford GT with Mueller were Joey Hand and Sebastien Bourdais. Starting on the outside of the front row was the No. 31 Whelen Engineering Cadillac DPi-V.R. The Cadillac was driven by Eric Curran, Dane Cameron, Seb Morris and Michael Conway. The team suffered a series of misfortunes – the first was contact with a PC car that damaged the suspension and then they encountered transmission problems. These issues caused the team to lose a total of twenty laps and finish fourteenth overall and sixth in class. 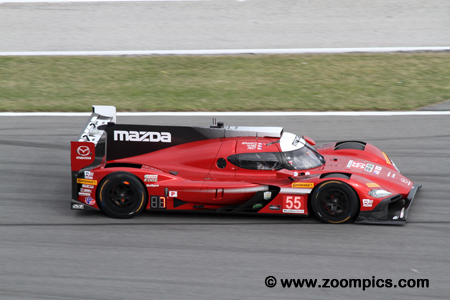 Mazda debut their new Prototype – they entered two Mazda RT24-Ps. The No. 55 Mazda driven by Tristian Nunez, Jonathan Bomarito, Spencer Pigot and Ben Delvin was running fifth in twentieth hour when a problem with an oil line caused the car to catch fire during a pit-stop. The second entry was forced to the garages for a transmission replacement – the car returned to the race but the gearbox problems returned and the team retired. There are always a few surprises during a 24-hour contest and the biggest was reserved for the No. 28 Alegra Motorsports Porsche 911 GT3 R. The car shared by Porsche works driver Michael Christensen, Canadians Jesse Lazare and Daniel Morad and the team owner Carlos de Quesada along with his son, Michael started thirty-seventh overall and eighth in GTD. A steady performance allowed them to take the class victory. Three of the four Ford Chip Ganassi Racing Ford GTs captured the top spots in GTLM qualifying. The pole-winning No. 66 Ford also took the class honours. The No. 67 Ford GT, shared by Richard Westbrook, Ryan Briscoe and Scott Dixon started second in class. Unfortunately, midway through the race, Briscoe spun the car and hit the wall at the ‘Bus Stop’. It took the crew an hour to make repairs – the team finished tenth in class. Two BMW M6 GTLMs were entered by BMW Team RLL. The No. 24 BMW was the first car to retire from the race after only fifteen laps with powertrain issues. The second car, the BMW M6 GTLM Art Car, designed by American artist John Baldessari, was driven by Bill Auberlen, Alexander Sims, Augusto Farfus and Bruno Spengler. They finished twelfth overall and eighth in GTLM – one lap behind the class winning Ford GT. The No. 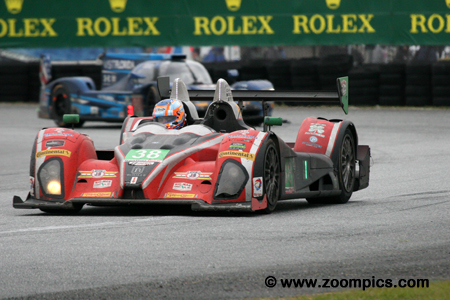 90 Visit Florida Racing entry was the slowest Prototype in qualifying. The Gibson-powered Multimatic/Riley MK 30 was a joint effort between Riley Technologies and Multimatic. Driving the car were Marc Goossens, Renger van Der Zande and Rene Rast. Although the team had a minimal amount of testing and were not optimistic about their chances of completing the event, they finished third overall – just one lap behind the winners. The No. 62 Risi Competizione Ferrari 488 GTE was shared by Toni Vilander, Giancarlo Fisichella and James Calado. It was the only Ferrari competing in the Grand Touring Le Mans category and started fourth, behind the three quickest Ford GTs. Calado was behind the wheel during the final restart and passed the first place Corvette. However, his lead short-lived as he was demoted to a third place finish by Mueller in the Ford and Pilet in the Porsche. Preventing the new Cadillac Dpi-V.R from sweeping the top three positions in qualifying was the Rebellion Racing ORECA 07. Neel Jani qualified the car, which is constructed to P2 rules, third. Also driving the ORECA were Sebastien Buemi, Stephane Sarrazin and Nick Heidfeld. By lap sixty they were no longer in contention. A series of issues plagued the team and at the checkered flag they were eighth in class. The new Acura NSX made an impressive debut. Michael Shank Racing entered two of these Acuras – they qualified seventh and ninth in the Grand Touring Daytona category. In addition, both cars led the class at some point during the twenty-four hours. The No. 86 Acura shared by Ryan Hunter-Reay, Jeff Segal, Oswaldo Negri Jr. and Tom Dyer produced the team’s best results. They finished fifth in GTD and were on the same lap as the class winners. 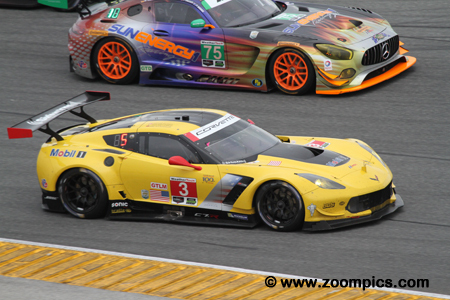 As usual Corvette Racing entered two Chevrolet Corvette C7.Rs. The defending race winners fell out of contention early in the event when Oliver Gavin stopped on the backstretch. The No. 3 entry driven by Jan Magnussen, Antonio Garcia and Mike Rockenfeller could not keep pace with the quicker Fords, Porsches and lone Ferrari. Quick pit stops allowed the team to finish fourth in GTLM. The lone Aston Martin in the field was driven by Paul Dalla Lana, Pedro Lamy, Mathias Lauda and Marco Sorensen. 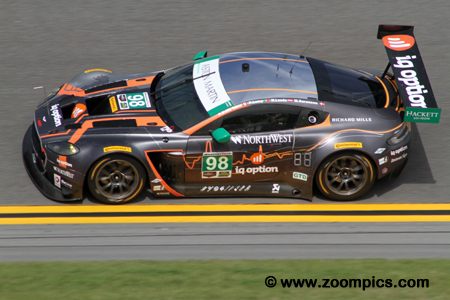 The car entered by Aston Martin Racing qualified third in the Grand Touring Daytona group and ran as high as second in the class. At the end of twenty-four hours the team had completed 593-laps, finished thirty-third overall and twelfth in their class. There were two Porsche 911 RSRs entered in the GTLM class by Porsche GT Team. The wet conditions favoured the new mid-engine layout in the Porsche. 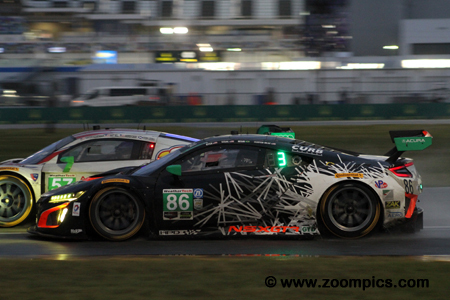 In the evening when the rain appeared, the Porsches had their turn leading the race. The quicker of the two cars was the No. 911 Porsche driven by Patrick Pilet, Dirk Werner and Frederick Makowiecki. In the final 15-minutes of the contest, Pilet charged from sixth to finish in second place. 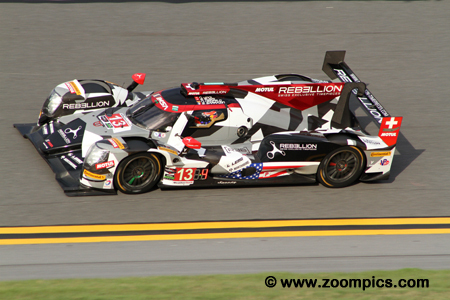 BAR1 Motorsports prepared two ORECA LMP09s for the Rolex 24. The No. 26 shared by Johnny Mowlem, Trent Hindman, David Cheng, Tom Papadopoulos and Adam Merzon finished a distant second to the class winners from Performance Tech Motorsports. 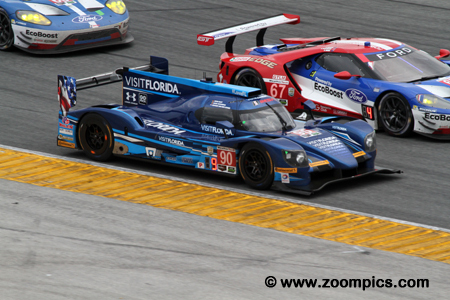 Despite enduring a number of issues they were seventeen laps ahead of the third place Prototype Challenge ORECA. There were three Mercedes AMG GT3s entered. One of the Mercedes was from SunEnergy1 Racing which had a troubled race but finished eighteenth in the Grand Touring Daytona category. The other two cars were prepared by Riley Motorsports. The most successful AMG GT3 was the No. 33 driven by Ben Keating, Jeroen Bleekemolen, Mario Farnbacker and Adam Christodoulou. They were third in class at the checkered flag. In 2016, an Audi R8 LMS GT3 captured the Grand Touring Daytona category victory. This year, the Montaplast by Land Motorsport effort came up just short of the win. 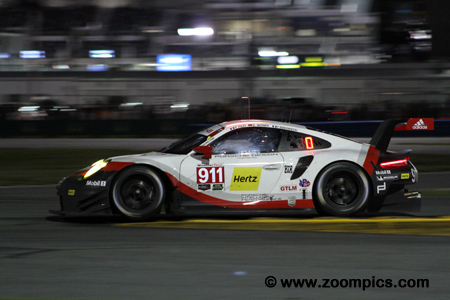 Drivers Connor De Phillippi, Christopher Mies, Jules Gounon and Jeffrey Schmidt were second at the end of twenty-four hours and finished on the same lap as the class winning Porsche.